1Programa de Pós-graduação em Biotecnologia, Núcleo de Pesquisas em Ciências Biológicas (NUPEB), Universidade Federal de Ouro Preto, Ouro Preto, MG, Brasil. *Corresponding author: lmmorei@iceb.ufop.br 2Programa de Pós-graduação em Biomas Tropicais, Universidade Federal de Ouro Preto, Ouro Preto, MG, Brasil. 3Laboratório de Bioquímica e Biologia Molecular, Universidade Federal de Ouro Preto, Ouro Preto, MG, Brasil. 4Instituto Prístino, Belo Horizonte, MG, Brasil. 5Departamento de Ciências Biológicas (DECBI), Instituto de Ciências Exatas e Biológicas, Universidade Federal de Ouro Preto, Campus Morro do Cruzeiro, Ouro Preto, MG, Brasil. The ferruginous rupestrian grasslands (FRG) in the Iron Quadrangle (IQ) are ecosystems characterized by rocky soils with reduced availability of water and nutrients, but high levels of metals. In order to comprehend the interference of microorganisms on the adaptive process of endemic plant Mimosa calodendrum (Fabaceae), bacteria associated with its roots and rhizosphere were isolated. Fourteen isolates were obtained and subsequently grown in the presence of different concentrations of arsenic (As) species. The isolate Mc250, an Alcaligenes faecalis strain, resisted to 10 mM of As (III) and 800 mM of As (V). In the presence of this strain, atomic spectrometer detected a reduction of 55% for As (III) and 72% for As (V) respectively in 10 mM and 500 mM solution. Scanning electron microscopy of this isolate demonstrated morphological modification and EDX spectroscopy revealed the presence of both As species adsorbed on the membrane, justifying the removal observed in the in vitro assays. 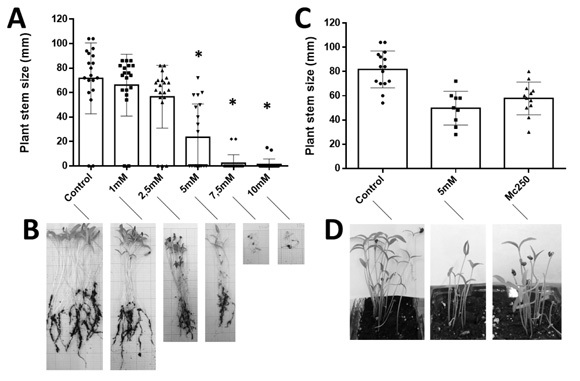 To validate this potential removal of As in vivo, tomato plants were used as grown model in the presence and absence of A. faecalis in soil previously contaminated with 5 mM of As (III). After 14 days, plants from contaminated soil had their growth improved when compared to untreated control plants. All these results suggest for the first time that plant-associated bacteria from FRG-IQ present potential for soil rhizoremediation and may benefit the adaptive processes of plants in extreme environments including application in recovering degraded areas. Keywords: Arsenic removal, arsenic resistant bacteria, Iron Quadrangle, Mimosa calodendron, plant growth-promoting rhizobacteria, rhizoremediation. Figure 1 Iron Quadrangle geographical location and area where Mimosa calodendron was sampled. A) IQ location highlighting elevated areas that stand out on their vertices. The colors identify the priority areas for biodiversity conservation of Minas Gerais flora (see legend) obtained from the digital atlas Geoambiental (http://www.institutopristino.org.br/atlas). B) Identification of the area in Moeda Mountain where Mimosa calodendron was sampled. The high geochemical diversity and intense mining activities resulted in soils and stream sediments with anomalous concentrations of many different trace elements such as Zn, Pb, Ni, Cr, and As. Arsenic is a heavy metal extremely toxic to any organism and its toxicity mechanisms in plants are well established (Seshadri et al., 2015). Average concentrations of arsenic in soils from the IQ regions are around 960 mg/kg, though in some situations it might reach up to 13400 mg/kg. These higher As-concentrations generally occur associated with magmatic sulfides and iron ores (Vicq et al., 2015). The iron geosystem of IQ consists of Cretaceous limonite cemented iron-caps, named cangas, and other lithotypes composed by high concentrations of metallic minerals especially iron and manganese. The extreme environmental conditions of cangas such as surface temperatures up to nearly 70°C, acids and impoverished soils, and substrates with high concentrations of metallic minerals, maintain plant communities characterized by a rarity and high degree of endemism (Carmo and Jacobi, 2016). The plant endemism in this region is directly related to their morphophysiological adaptations associated with production of osmolytes, alteration in water transport, and detoxification of reactive oxygen species (Vincent and Meguro, 2008). Due to the presence of such adaptive traits, these plants are characterized as metalliferous, which can be grouped as hyperaccumulators, metallophytes (with endemic taxa from metal-bearing areas), and pseudometallophytes. In southeastern of Brazil these peculiar vegetation is classified as Ferruginous Rupestrian Grasslands (FRG) (Silveira et al., 2016). Metallophytes communities of plants from FRG represent one of the most relevant for conservation purposes since they can provide ecological services such as phytoextraction, phytostabilization, and phytoprospection (Ginocchio and Baker, 2004), being for some authors considered a diversity hotspot region (Silveira et al., 2016). In FRG, sixty canga endemic plants were catalogued (Carmo and Jacobi, 2012); however, a few have been better characterized in an ecological context, as is the case of the leguminous Mimosa calondendron Mart. ex Benth(Fabaceae). This nodulating shrubby leguminous species may be an important N2 fixer, and even act as a "nurse plant" promoting, for example, shadowing, which in turn would favor the recruitment and establishment of seedlings. 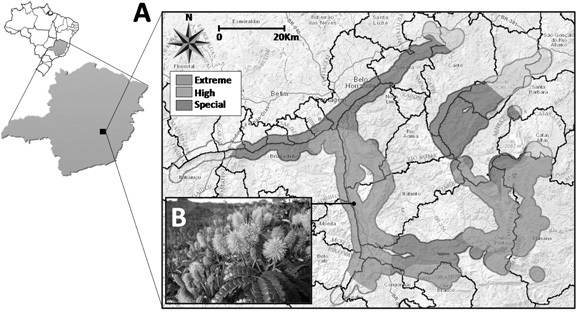 Nevertheless, there are no studies connecting Mimosa calodendron or any other endemic species from this region with the soil microbiota, except a few works demonstrating the relationship of some of these plants to phosphate metabolism (Matias et al., 2009). In contrast, it is known for other models the importance of Plant Growth-Promoting Rhizobacteria (PGPR) in the maintenance and growth of plant species that can act in bioremediation, biocontrol, and biofertilization (Jimtha et al, 2016; Banerjee et al, 2017). In this context, they seem to be fundamental to survival, maintenance and adaptation of plants to FRG. Based on this geochemical and environmental perspective, the main purpose of this study was to investigate, although in a preliminary and focused manner, the importance of bacteria associated with the rootsand rhizosphere of Mimosa calondendron, as bioremediator of soils contaminated with high As concentrations. Three Mimosa calodendron roots and rizhosphere samples were collected from the Moeda Mountains (latitude 20°15 ,83,,S, longitude 43°97, 41,,W), Minas Gerais State, Brazil (Figure 1B). The samples were transferred to laboratory 4 hours after collected. The samples were serially diluted (up to 10−6) and inoculated in Petri dishes (60 x 15 mm) containing Luria-Bertani (LB) agar medium (tryptone 10 g/L, yeast extract 5 g/L, sodium chloride 10 g/L, agar 15 g/L, adjusted to pH 7.0). The root samples were washed to external disinfection following the steps:9 g/L NaCl solution for 2 min, 70% alcohol for 2 min, 2% sodium hypochlorite solution for 2 min, and 9 g/L NaCl solution for 2 min. Slices of roots pre-disinfected were inoculated on LB agar medium surface. In both cases, the plates were incubated at 28 ºC for up to seven days. To isolate bacterial strains, the colonies were individually streaked in anotherPetri dish containing LB agar medium. Fourteen isolates were originally obtained and kept in LB medium slants in 15% glycerol at −80 ºC. BOX-PCR analysis was used to verify molecular characterization of bacterial isolates (Versalovic et al., 1991). The PCR reaction was prepared to a final volume of 25 μl containing: 2 μl of DNA, 4 μl primer BOX (BOX 1AR) 50 pmol, 4 μl of PCR buffer 5X (Fermentas), 1 μl 25 mM MgCl2, 3 μl dNTP 10 mM, 0.3 μl of 5U TaqDNA polymerase (Fermentas), and the final volume filled with sterile distilled water. The PCR thermocycler (Biosystems) was used under the following conditions: initial denaturation at 95 °C for 5 minutes followed by 35 cycles of 1 minute denaturation at 95 °C, 1 minute annealing at 53 °C, and 2 minute extension at 72 °C. A final extension was incorporated for 10 minutes at 72 °C. PCR products were analyzed by 0.8% agarose gel electrophoresis in 1x TBE buffer, eluted in 6X run buffer stained with ethidium bromide for approximately 30 min at 120V. All isolated bacterial strains were screened for arsenic resistance assay. These strains were grown on LB plates containing different concentration of As (V) (Na2HAsO4) ranging from 0.5 to 500 mM (~ 150 to 250.000 mg kg-1) and As (III) (NaAsO2) ranging from 0.1 to 10 mM (~ 13 to 1.300 mg kg-1). All plates were incubated at 28 °C for up to 3 days. Mimosa calodendron isolate 250 (Mc250) was found to be resistant to 800 mM As (V) and 10 mM As (III). This bacterial strain has been selected for further analysis. Pure culture of Mc250 strain was grown overnight in LB medium for the isolation of genomic DNA using QIAmp® DNA Stool Mini Kit (Qiagen) following the manufacturer,s instructions. The identification was carried out through PCR amplification of 16S rDNA. The As resistant isolate was named Alcaligenes faecalis strain Mc250 and its sequence data have been deposited in the GenBank (accession number KY271067). Sequence analysis of the isolate was compared with 16S rDNA sequences using Blastn search. In order to study the effect of metal concentration on bacterial growth, A. faecalis strain Mc250was inoculated in LB broth with and without 10 mM As (III) and 800 mM As (V), and incubated at 28 °C under shaking conditions at 180 rpm. Growth was monitored spectrophotometrically at 600 nm at every three hours until constant readings were observed in control and test samples. The A. faecalis strain Mc250 was grown at 28°C in two Erlenmeyer flasks of 500 mL containing both 300 mL nutrient broth and 500 mM As (V) and 10 mM As (III) each one. As-free media was taken as a control. The flasks were placed in an orbital shaker at 150 rpm at 28 ºC. Culture broth of 10 mL was collected, centrifuged, and the supernatant analyzed by atomic absorption spectrophotometry. Finally, total arsenic and other heavy metals were determined. The sixteen-hours grown culture of A. faecalis strain Mc250 was inoculated (1%, v/v) in two LB plates with 500 mM of As (V) and 10 mM of As (III) respectively, and incubated for 72 h at 28 °C. Cells were harvested after incubation by centrifugation and washed twice with sodium phosphate buffer (pH 7.4). Cells were then fixed with paraformaldehyde solution (0.5%) and washed twice with sodium phosphate buffer. Dehydration of cells was carried out in gradient of ethanol, and the fixed cells were sputtered with gold nanostructures (Focardi et al., 2010). The scanning electron microscopy observation and energy dispersive X-ray spectroscopy analyses were performed at NanoLab of Centro Mínero-Metalúrgico da Rede Temática em Engenharia de Materiais (CMM-REDEMAT). A greenhouse experiment was conducted to evaluate the effect of bacterial isolates on plant growth and As uptake by tomato Santa Clara 5800 cultivar. It was previously performed a tomato growth curve for different concentrations of As (III) in order to detect which metal concentration affects plant growth. The limiting concentration of 5 mM was established for As (III). The soil sample was contaminated with 5 mM of As (III) and two days later, 20 tomato seeds were planted in the flask and inoculated with bacteria resistant to metal (Mc250). The culture was previously prepared by growing in liquid LB to reach 1 O.D. and centrifuged for 10 minutes at 5000 rpm. The pellet was resuspended in tap water and this solution was inoculated in the contaminated soil. After 14 days of growth, the plants had the stem size, root, and germination rate measured. A total of 14 isolates were obtained from the collected samples. All of them were tested in different concentrations of arsenite varying from 0.5 to 10 mM; and arsenate varying from 1 to 1000 mM. Three isolates stood out because they resisted to elevated concentrations of both arsenic species investigated: Mc250 and Mc251 (10 mM As (III) and 800 mM As (V)), and Mc252 (5 mM As (III) and 800 mM As (V)), all associated with Mimosa calodendron rhizosphere. Before the selection of resistant isolates for the further tests, a PCR was performed with BOX primer in order to evaluate the genetic similarity of the isolates through band patterns analyses (Figure 2). As a result, Mc250 and Mc251 isolates had the same band pattern suggesting that they are the same microorganism. Thus, as their resistance capacity was the highest, in-depth studies were carried out with Mc. Figure 2. 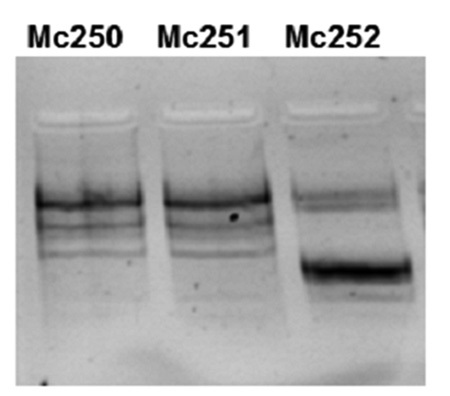 PCR with BOX primer using Mc250, Mc251, and Mc252 isolates. Mc250 and Mc251 isolates showed the same band pattern suggesting they are the same microorganism. Using 16s rRNA sequencing, the arsenic resistant bacteria Mc250 was identified as belonging to Alcaligenes faecalis strain (GenBank accession number KY271067) with 99% identity with other bacteria of the same genera and specie. The minimum inhibitory concentration (MIC) for sodium arsenite was 12.5 mM in LB broth, where 99% of cellular growth inhibition for A. faecalis strain Mc250 was observed (Figure 3A). The isolate growth curve in the presence and absence of As (III) and As (V) is shown in Figure 3B. A. faecalis strain Mc250 exhibited a stationary phase with 24 hours. Besides different OD values, these strain showed a stationary phase with 54 hours in the presence of both As species. Compared to the control, the strain Mc250 showed a prolonged lag phase in both conditions (presence of both As species). Thus, it is likely that this differential growth rate reflects the protein expression patterns of A. faecalis strain Mc250under stress caused by As. Figure 3A) Growth curve of A. faecalis strain Mc250 in LB broth without As (circle), in LB broth with 10 mM of As (III) (square) and in LB broth with 800 mM of As (V) (triangle). B) Minimum inhibitory concentration (MIC) of As (III) (graph bar) and percentage of inhibition of A. faecalis strain Mc250 cells in different concentrations of As (III) (line graph). The asterisk above bars indicate statistically significant difference among the groups (p<0.05). Table 1 Removal values of As (III) and As (V) in the presence of A.faecalis strain Mc250. The scanning electron microscopy (SEM) of A. faecalis strain Mc250 cells without (control) and with exposure to As (III) and As (V) are shown in Figure 4A-C, respectively. SEM analysis of the arsenic treated and untreated cells displayed distinct changes in cell size. The effect of arsenic was visible through increase in cell volume. This remarkable increase in cell volume may be interpreted as a possible strategy of the cell to improve the accumulation of arsenic from the surrounding environment in order to minimize its toxicity. However, in both situations cells were flat and showed intact surfaces. The energy dispersive X-ray spectroscopy (EDS) revealed the presence of As (III) and As (V) adsorbed on the membrane of this isolate. Figure 4 Scanning electron microscopy (SEM) of A. faecalis strain Mc250 cells without As (control) (A) and with exposure to As (III) (B) and As (V) (C) with respective EDS. Tomato growth curve in the presence of As (III) revealed 5 mM as a limit concentration for a satisfactory growth. Although there was no statistical significance through Kruskal-Wallis and Dunn`s test analysis (Figure 5C), a relevant visual growth improvement was detected as shown in Figure 5AB. Moreover, the presence of A. faecalis strain Mc250 in soil contaminated with this As (III) concentration demonstrated an improvement in the germination rate (15%), and stem size (10%). These differences are demonstrated in the graphic and in Figure 5CD with the phenotype reversion. Figure 5A) Growth curve of tomato plants treated with 1 mM, 2.5 mM, 5 mM, 7.5 mM, and 10 mM of As (III) and untreated control. B) Tomato plants treated with As on each respective concentration. C) Growth curve of tomato plants in As-contaminated soilwith 5 mM of As (III) without the isolate, in the presence of A. faecalis strain Mc250, and untreated control. D) Tomato plants in the respective conditions of "C". The asterisk above bars indicate statistically significant difference among the groups compared to the control (p<0.05). High levels of trace elements are toxic for any organism due to blockage of biological functions or modification of essential protein structures (Tak et al., 2013). On the other hand, in small amounts, some heavy metals are essential for plant development and the absence of them induce the reduction of the growth rate (Tak et al., 2013). Arsenic is a heavy metal extremely toxic to living organisms and its mechanisms of toxicity in plants is well known. Both the inorganic arsenic species (i.e. III and V) operatedifferently when absorbed by plants; however, they affect directly the growth of aerial parts, roots, and fruit production (Garg and Singla, 2011). As (V) competes with inorganic phosphate (Pi) by binding its transport system (Pst) present in cellular membranes and interferesirreversibly in plant metabolism by acting directly on reactions that involve Pi, such as cellular metabolism, DNA metabolism, and cell signaling (Finnegan and Chen, 2012). As (III) penetrates plant tissues by aquaporins, and once in contact with plant tissues it interferes in protein folding due to its ability to bind to sulfhydryl groups (Dixit et al., 2015). In both cases, the higher the heavy metals concentration, the higher the production of reactive species. Plants have developed a sophisticated repertoire of molecular mechanisms to reduce damages caused by these metals. 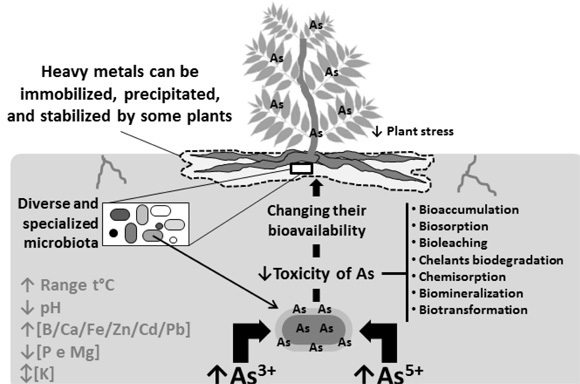 Some species are able to accumulate (hyperaccumulators), degrade, eliminate, translocate metals into their biomass, create a region surrounding the roots where the metal is precipitated and stabilized, or even convert metals into volatile compounds or less toxic forms (Mirza et al., 2014). In contrast, the survival of non-phytoaccumulator plants in metal-rich environments is improved by the presence of a specialized microbial community (Seth et al., 2007).In addition to protect plants from toxic effects, these communities often facilitate nutritional uptake by enhancing plant growth (Tak et al., 2013). It has been demonstrated that As-resistant bacteria associated with Pteris vittata, a hyperaccumulator plant occurring on IQ that improve plant growth and help in metal removal (Han et al., 2016). This study described for the first time the presence of As-resistant bacteria associated with roots and rhizosphere of Mimosa calodendron, an endemic and crucial species topositive interactions on FRG (Figure 1). One of the bacteriaidentified, belongingto the genus Alcaligenes, wasanalyzed for its potential in arsenic removal from As-contaminated environments as this isolate presented resistance to high As concentrations when compared to those already described in the literature (Kruger et al., 2013). Besides the resistance to such high concentrations, A. faecalis strain Mc250 has the in vitro capacity to remove respectively 55% and 72% of As (III) and As (V) in solution (Table 1). It is noteworthy that these assays were performed with much higher As concentrations than those found in naturalenvironment (Vicq et al., 2015). Thus, its bioremediation potential might present better efficiency in natural conditions. A morphological study through scanning electron microscopy (SEM) of A. faecalis strain Mc250 revealed that when treated with As (III) and As (V) they modified from rod-shaped to rounded shape (Figure 4). This morphology modification indicates metal accumulation and results from changes in the osmotic potential and cell turgor (Pandey and Bhatt, 2015). EDS analysis of A. faecalis strain Mc250 revealed that As was also adsorbed to the membrane (Figure 4). Similar data has been described by (Pandey and Bhatt, 2015)who showed increase in the area of one isolate asa positive response to As (V)-contaminated environment. The bioaccumulation of the isolated was confirmed by transmission electron microscopy (TEM) and EDX. According to the hypothesis that this isolate could aid in plant growth in As-contaminated soil, tomato plants were used as a model since its growth rate is higher than FRG native plants. Tomato growth curve for different concentrations of As (III) was established (Figure 5A) in order to determine in which concentrations these assays would be performed. The results demonstrated that in 5 mM not only the seeds germination was broken off, but there were also significant reduction in plant growth. In addition, while only 9 out of 20 seeds (45%) germinated in As-contaminated soil and in the absence of A. faecalis strain Mc250, 12 out of 20 seeds (60%) germinated in soil contaminated in the presence of this isolate. Moreover, the growth rate of tomato plants in the presence of A. faecalis strain Mc250 was higher than in the absence of this isolate. In fact, heavy metals resistant bacteria can minimize toxicity by acting as plant growth promoters (Mallick et al., 2015). Therefore, the results presented in this study demonstrate for the first time the potential of bacteria associated with roots and rhizosphere of endemic plants from FRG as soil bioremediator agents (Figure 6). Figure 6. FRG are very restrictive to establishment of species due to great temperature variation, low pH, soils with reduced availability of water and nutrients, low concentrations of phosphorous and magnesium, but high levels of metals such as iron and manganese, and anomalous concentrations of many different trace elements such as Zn, Pb, Ni, Cr, and As. In order to reduce damage caused by these metals, some plants have developed molecular mechanisms to deal with such conditions. They can accumulate (hyperaccumulators), degrade, eliminate, translocate metals into their biomass, create a region surrounding the roots where the metal is precipitated and stabilized, or even convert metals into volatile compounds or less toxic forms. Furthermore, a specialized microbial community could modify metal bioavailability assisting hyperaccumulator and non-phytoaccumulator plants through different processes such as bioaccumulation, biosorption, bioleaching, chelants biodegradation, chemisorption, biomineralization, and biotransformation. These bacteria associated with endemic plants from FRG-IQ may benefit adaptive process facilitating the maintenance of this species in extreme environments. Thereby, to protect plants from toxic effects, these communities often facilitate nutritional uptake by enhancing plant growth. Environments with high metal concentration in soils as occur in FRG are very restrictive to the establishment of species (Jacobi et al., 2007) in view of the fact that it establishes a selective pressure which influences plant communities (Shure et al., 2007). According to Silveira et al. (2016), and following the guidelines established by Hopper, FRG presents the five characteristics necessary to be considered an Old Climatelly-Buffered Infertile Landscapes (OCBILs). According to the authors, the characteristics 4 and 5, which correspond respectively to nutritional and other biological specializations for resource acquisition and high vulnerability to soil removal, may also be justified by the presence of a specific and specialized microbiota. It is known that PGPR as well as other microorganisms associated with plants such as mycorrhizae play a key role in the adaptation of plants to these environments (Carvalho et al., 2012). Since the ecological diversity of a community can be determined by ecological and evolutionary processes (Heijden et al., 2008), plant-bacteria interaction may be assumed as a mutualistic association originated from these processes that have occurred over generations and allowed colonization of metal-contaminated environments by plants. The results obtained in this study suggest that habitats colonized by plants in FRG soils is attributed not only to morphological adaptations of species (Alves and Kolbek, 1994), but also to molecular adaptations generated from interactions with bacteria. Considering that iron-rich environments are usually habitat to rare flora characterized by high percentages of species with restricted geographical distribution (Silveira et al., 2016), it is possible that they are deeply associated with complex and restrictive coevolutionary processes (Grime, 1977). In this context, plants provide organic molecules originated from its metabolism for bacteria and other microorganisms, which in turn minimizes the potential damage that could be induced by metal and other soil components (or their deficiency, as in the case of P) to plant tissues. This is a possible explanation for the extreme plant vulnerability due to soil removal and consequently elimination of specialized microbiota associated with it. Some authors describe the restoration of degraded areas in rupestrian grassland as a challenging process (Lambers et al., 2010). This is reiterated by some promising empirical attempts that, notwithstanding, still have low success (Stradic et al., 2015). According to the importance of microorganisms in the association between soil and plants, it is possible that this low success results from changes in the composition of the soil microbiota or its association with plant roots, which reduce the adaptive potential. Thus, the restoration studies should be complemented by studies of soil microbial ecology maintenance. Silveira et al. (2016) recently reported that despite the increase in the last two decades in the number of indexed scientific articles on FRG and related topics, they are still incipient and polarized in some areas of scientific knowledge, which explain the neglected study of one of the most biologically diverse and endangered ecosystems of the word. This is even more noticeable in studies related to microorganisms associated with this environment. This study, therefore, provides a wide range of opportunities to understand the real role of microorganisms associated with soil and plants of FRG, allowing the discovery of new microorganisms (due to the high number of endemic plants in this region and its geological and evolutionary origin), as well as metabolic pathways, genes, and metabolites with wide ecological and biotechnological interest. In this case, products and processes that could be conjectured as ecosystem services,also neglected, could be used as scientifically-based conservation strategies to support proposals for the conservation of ferruginous fields. The results presented in this study, provides not only a great opportunity for new investigations that may assist in understanding the adaptation of metallophyte plants, but also signals the biotechnological potential of microorganisms in a neglected environment in systematics and in-depth scientific studies. Taking other models of plant-bacteria interaction in hostile environments as reference, it is possible to infer that the PGPR in rupestrian grassland also develop a key role in the system ecology allowing survival and maintenance of plant species from this environment. Thus, the acquisition of more isolates from a larger number of plants in this region is required for complementary scientific contributions about the microbiota from FRG. The authors express their gratitude to the staff of the Laboratory of Biochemistry and Molecular Biology (LBBM, Federal University of Ouro Preto, UFOP) for their support. Ney Sampaio and NanoLab of Centro Mínero-Metalúrgico da Rede Temática em Engenharia de Materiais (CMM-REDEMAT) are thanked for spectroscopy and microscopy analyses, respectively. Funding for this work was provided by the following agencies: Conselho Nacional de Desenvolvimento Científico e Tecnológico (CNPq) and Coordenação de Aperfeiçoamento de Pessoal de Nível Superior (CAPES). Thanks to Prof. João Carlos Setubal (IQ-USP) for the help with assembly and identification of the sequence deposited at Genbank. Stradic, S.L.E., Silveira, F.A.O., Buisson, E., Cazelles, K., Carvalho, V., Fernandes, G.W. 2015. Diversity of germination strategies and seed dormancy in herbaceous species of campo rupestre grasslands. Austral Ecology. 40, 537-546.